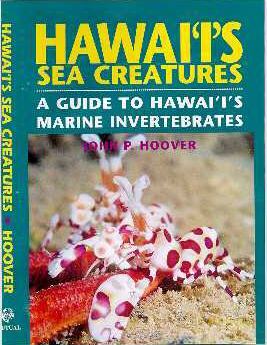 These are among the most frequently seen nudibranchs in Hawai`i. Clustering in small groups under ledges or on vertical faces, they feed on a common gray sponge (Cacospongia sp.). Their white egg coils often lie nearby. The tan dorsal surface is finely speckled with orange-brown. It is surrounded by a conspicuous white margin that in turn has a scarcely visible orange-brown edge. (In some Indo-Pacific localities this edge is reddish and prominent, giving the species its scientific name, "red margin.") The gills and rhinophores are brown and white. Previous publications on Hawaiian nudibranchs have identified this species as G. youngbleuthi, Chromodoris youngbleuthi or Chromolaichma youngbleuthi, names now regarded as synonyms. To about 1 in., but usually half that size. Indo-Pacific. 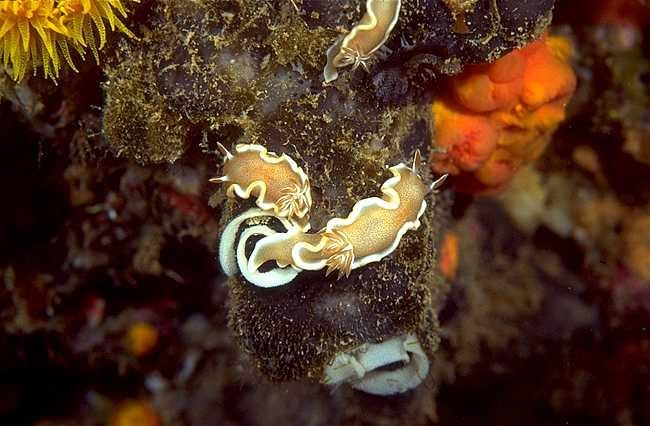 Webmasters Note: For a previous posting of this animal as the Branch of the Week, see Glossodoris rufomarginata .